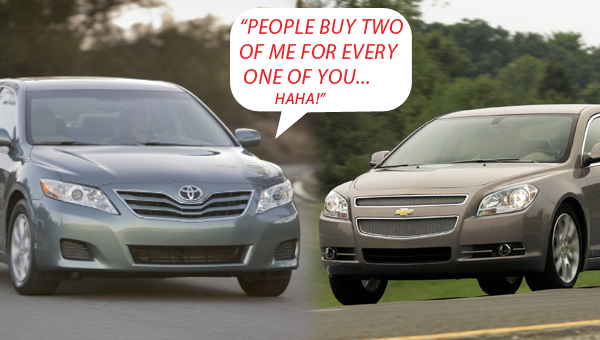 How Much Longer Will Toyota’s Camry Outsell The Chevy Malibu At A 2:1 Ratio? What defines a successful vehicle? Is it a car’s popularity, the respect it commands in the industry, the per-unit profits, or the good-ol sales numbers? For many mainstream brands, the scale on which a model’s success is measured is the last one in that list – the annual sales results. Ford’s F-150 and Toyota’s Camry are perfect examples of vehicles that are sales leaders in their respective classes, the latter selling close to half a million units in a single year! Since Chevrolet, along with the automotive press, have been touting the advantages of current-gen Malibu, emphasizing that it’s a better midsize sedan than the competition from Japan, some may be surprised to learn that our favorite bow tie-wearing midsize sedan has been outsold by the Camry by a wide margin for (at least) the last ten years in a row (numbers available after the jump)! But things are on the up and up for the Malibu, since for the first three months of 2010, GM’s U.S. dealers delivered more than 49,000 copies of the midsize sedan. This represents a 58 percent increase over the same time period last year, resulting in the return of a third shift of nearly 1,050 jobs at GM’s Fairfax, Kansas plant. While that’s an astounding percentage increase, it should be noted that in 2009, Chevy sold a measly 161,568 Malibus in America, compared to 356,824 Toyota Camrys. Nevertheless, the Malibu looks to be on track to move 200,000 units in 2010. Even though that’s still nowhere near the projected sales amount of the Camry (about 350,000), it’s still a hefty increase (that all Chevy and GM fans should welcome with open arms). In the mean time, Chevrolet has tons of work to do in catching up with the competition (read: Toyota). Currently, we know that Chevy is hard at work on the next-generation Chevrolet Malibu, which should be revealed sometime in 2012. Most recently, GM announced that it will invest $136 million in its Fairfax, Kansas plant to build the next-gen ‘Bu. And just in case demand outstrips supply in that plant, The General also invested $121 million in the Detroit-Hamtramck plant for extra production capacity of the Malibu. Let’s hope that the 2012/13 model, along with GM’s creative marketing efforts, will close the tremendous sales gap between the ‘Bu and the Camry. We have competitive sales charts of the Malibu vs. its most direct competition after the break! We rented a 2011 Malibu for my dad to test drive since he hated going to a dealership for the non-stop nagging he thought he would get. It seems like a nice car. Engine is quiet and the car rides good. What we didn’t care for was we kept bumping our head getting in/out (were both 6′), 4 cyl. engine was not too quick, it shifted weird from 2-3 (6 speed), and rear visibility is somewhat limited. My wife and I own a 2000 Impala LS with the 3.8 liter and 206,000 miles and we get the same MPG as my dad’s new 2012 Malibu LS on the highway? After riding in our Impala, my dad’s Malibu seems kind of tight inside (especially where your right knees rests) and I won’t say how small the opening for the trunk is. He worked for GM his entire working career and that is the one big reason he bought it in the first place. I sat in a new Camry at a car show recently and I was so impressed with how comfortable they felt. I have NOT driven a new Camry yet, but with Toyota selling twice as many as the Malibu, there has to be a reason why they are so popular. The 2013 Malibu looks OK, but direct injection engine problems just seem to be popping up. I think I would rather stick with conventional fuel injected engines for the next 5 years atleast, which would make my descision to get that Toyota Camry over the new Malibu, ontop of that, the new Camry gets better MPG than Malibu to boot. I still like GM and always have, but Kia and Hyundai are looking really good now and I wonder in 5 more years how their cars will look? If the new Impala looks like a newly designed Malibu but 25% larger, I will have to look elsewhere. Overall, my dad likes his new Malibu, but he said its not like his old cars that he truly enjoyed. He needed a new car after his old one rusted through by support mounts. That is the only reason he bought this one. I think people still choose Camry bc of the quality reputation that Toyota has (I think they already lost that). Even though people say they ride like a boat but you know there are some people that they don’t give a crap about it. They just want something comfortable, a little stylish, gets good fuel economy, reliable, and list goes on and on. But before i bought the G6 i even looked at the Camry but it’s so damn loud and so underpowered. So that’s why I bought the G6 V6 since at that time it gets better mileage than the 4 cyl Camry. Right now I’m averaging about 26 mpg in mixed driving and that’s technically about the same as the Camry. Agreed. It’s the de-facto safe choice — and there’s nothing wrong with that. The thing that I really like about the Camry (that enthusiasts pan it for) is that it’s so disconnected from the road and so comfy. It’s not a couch on wheels — it ain’t no Lucerne, Impala, or DTS. No, it’s just a soft-riding car that is comfy. It’s not meant to be pushed around corners at extreme Gs or get rubber-burnin’ 0-60 times. It’s a comfy, safe, reliable car that’s good — plain and simple. That’s not what most car enthusiasts look for in a vehicle, but it works for most people. I don’t even know if it’s all about quality. Until now, the Camry had hard materials in the interior while still selling like hot cakes. I would say it’s totally up to consumer perception — whether true or false. Then again, quality and reliability are extremely important — so it’s a matter of making a reliable product of high quality on a consistent basis. I will say this though, I have heard a lot of people complaining about the gaps that the Corolla has though just few days after they purchase it. Yeah, the Corolla is garbage — at least the current generation is. It’s fine for getting you from A to B, but when it comes to actual quality or any kind of refinement, it fails miserably. Had to rent one for two months. Such a POS, I thought I was a second-class citizen! But I also thinks that the interior of the new camry is garbage. Before it comes out, I thought the interior is going to look as nice as a LaCrosse. But it’s such a huge disappointment. The interior of that car just looks like they slabbed Tundra’s interior and put it onto the Camry. Like it just looks like a truck’s interior to me. I also don’t find it Technological like how Akio says besides the Entune system. Agreed. Who thought that passenger-side air vent covered by an upward-sloping dash piece would be a good idea? Interiors were never Toyota’s strong suit… if anything, though, the Camry’s interior should be on par with that of the Malibu. And it’s not. I got scared for a minute there Mr. Luft! I thought I was going to have to forward you a link to lenscrafters! I read your comment too fast and thought you said the Camry’s interior was on par with the Malibu’s! On a side note: Am I the only one who thinks that the outgoing generation Camry interior looks of higher quality than the newer one? Nope, you’re not the only one. The interior on the new Camry is plain weird. I have to wonder, though, if your average midsized sedan buyer will even notice the difference. I would sure hope they will, but I’m skeptical. It’s horrible, like I said it just looks like they put 4-runner’s, tundra’s interiors combined and slabbed onto the Camry. I think they have to realize that you have to look luxurious instead of looking like a truck inside.